Why choose from our huge selection of 100% cotton and Blended Cotton Drapery Fabrics? 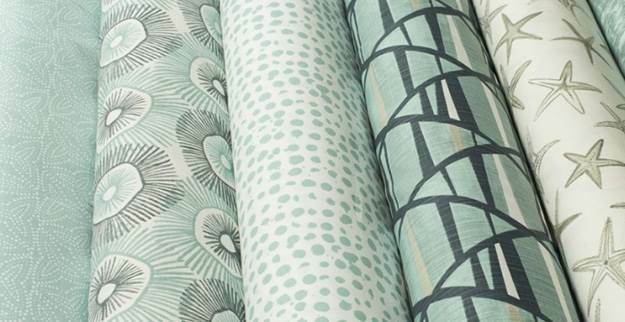 Because cotton decorative fabrics are natural, soft and easy to care for with a spot clean or gentle wash. Cotton drapery and upholstery fabrics are what we call multi use fabrics. Cotton fabric looks great as draperies and curtains. Not only that but cotton is perfect for many other home decorating projects like sofas, slipcovers, bedding, bedspreads, duvet covers, headboards. valances, kitchen and dining chairs, tabletop, tablecloths, and even dorm rooms. And the good news you can find the best name brand drapery and upholstery fabrics at nice discounts right here at BuyFabrics.com. Checkmate Kiwi Green Buffalo Check Fabric We just love these big buffalo checks. This home decor fabric is bright green and ivory. It's finely woven but you can feel comfortable using it for light-duty upholstery or cushions. I think it would be great for headboards, ottomans, sofas, chairs, drapery, and even duvet covers. Would you believe valances? This is a very special 100% cotton home decor fabric. Checkmate Gray Buffalo Check Fabric We just love these big buffalo checks. This home decor fabric is grey and ivory. It's finely woven but you can feel comfortable using it for light-duty upholstery or cushions. I think it would be great for headboards, ottomans, sofas, chairs, drapery, and even duvet covers. Would you believe valances? This is a very special 100% cotton home decor fabric. Checkmate Blossom Pink Buffalo Check Fabric We just love these big buffalo checks. 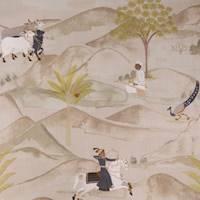 This home decor fabric is pink and white. It's finely woven but you can feel comfortable using it for light-duty upholstery or cushions. I think it would be great for headboards, ottomans, sofas, chairs, drapery, and even duvet covers. Would you believe valances? This is a very special 100% cotton home decor fabric. Sylva Navy Blue Cotton Buffalo Check Fabric This timeless buffalo check pattern is the perfect&nbsp;choice for window treatments, decorative pillows, light-duty upholstery, cushions, and much more. This fabric is woven and is 100% cotton. Plato Italian Denim Waterbury Slub Fabric This printed cotton fabric features a contemporary dotted design in off-white, light spa blue, and dark blue. This fabric would make gorgeous drapes or bedding and could also be used as cushion fabric, bedding fabric, headboard upholstery or other lightweight upholstery. The base cloth is 100% cotton with a slub texture. Hand wash cold with mild detergent. Printed in the U.S.A. Empire Optic White Upholstery Fabric This Bright White Fabric is a medium weight cotton. Heavy enough for light upholstery, but also light enough for drapes! The nice textured surface of this cotton gives it the beautiful finish.  Topsider Optic White Upholstery Fabric Topsider Optic White Upholstery Fabric This upholstery weight fabric is suited for uses requiring a more durable fabric. Uses include any upholstery project, sofas, chairs, dining chairs, pillows, certain types of window treatments, handbags and craft projects. Reza Resort Embroidery Drapery Fabric A beautiful embroidered drapery fabric perfect for bringing brightness and fun to any room! Chelsea Noir Black Floral Drapery Fabric This gorgeous fabric features a floral design of lilies, hydrangeas and other flowers in shades of pink, pale purple, and off-white on a black background. Suitable for drapery or curtain fabric, including all kinds of window treatments, drapes, curtain panels, shades, valences, and more. Also suitable for pillow fabric, bedding fabric, and other home decor applications. Baby Twill White/White This 100% cotton twill fabric is an excellent choice for a variety of home decor applications including slipcovers, lightweight upholstery, cushion fabric, and more. Machine wash cold water. Silas Blush Slub Canvas This printed cotton fabric features a contemporary floral design in off-white and light pink. This fabric would make gorgeous drapes or bedding and could also be used as cushion fabric, bedding fabric, headboard upholstery or other lightweight upholstery. The base cloth is 100% cotton with a slub texture. Hand wash cold with mild detergent. Printed in the U.S.A.